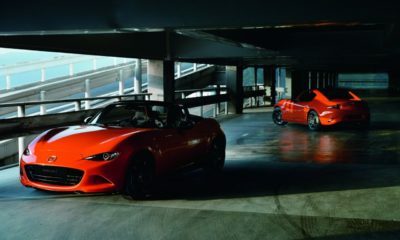 Mazda just revealed the new Mazda MX-5 RF at the 2016 New York Auto Show. The 2017 MX-5 RF where ‘RF’ stands for ‘Retractable Fastback’ will go on sale later this year. The modern incarnation of the MX-5 has already proved to be a success which was available as a soft-top convertible, until recently. The MX-5 RF adds a Porsche 911 Targa-style roof to the lightweight sports car which we think looks sweet. The metal roof of the RF can be stowed away in a cavity just behind the seats at the touch of a button. It takes just 12 sec for the roof to disappear even at speeds up to 6 mph. Mazda had to engineer a three-piece folding roof for this purpose and boy did they succeed, as luggage space is not compromised even with the roof down. It still uses the same 1.5-liter and 2.0-liter, 4-cylinder engines as the soft-top. 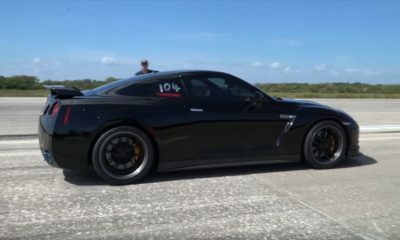 Performance is quite adequate given the weight of the car and can be had with a 6-speed manual or automatic transmission. The RF features a new steering rack and re-tuned suspension. The addition of a metal top must have added weight and hence the suspension tweaks. The 2017 Mazda MX-5 RF will be available in ‘Machine grey’ exterior color unique to this version of the MX-5. The roof panel comes in contrasting piano black finish. Prices for the MX5-RF will be disclosed at a later date. For all the latest updates from the 2016 New York Auto Show hit the link.